The main question we addressed in the present study was whether there is an objective beauty, i.e., if objective parameters intrinsic to works of art are able to elicit a specific neural pattern underlying the sense of beauty in the observer. Our results gave a positive answer to this question. The presence of a specific parameter (the golden ratio) in the stimuli we presented determined brain activations different to those where this parameter was violated. The spark that changed the perception of a sculpture from “ugly” to beautiful appears to be the joint activation of specific populations of cortical neurons responding to the physical properties of the stimuli and of neurons located in the anterior insula. Cinzia Di Dio et al. See Figure 7 for evidence of the substructure within the Native American race. We examined genetic diversity and population structure in the American landmass using 678 autosomal microsatellite markers genotyped in 422 individuals representing 24 Native American populations sampled from North, Central, and South America. These data were analyzed jointly with similar data available in 54 other indigenous populations worldwide, including an additional five Native American groups. The Native American populations have lower genetic diversity and greater differentiation than populations from other continental regions. We observe gradients both of decreasing genetic diversity as a function of geographic distance from the Bering Strait and of decreasing genetic similarity to Siberians—signals of the southward dispersal of human populations from the northwestern tip of the Americas. We also observe evidence of: (1) a higher level of diversity and lower level of population structure in western South America compared to eastern South America, (2) a relative lack of differentiation between Mesoamerican and Andean populations, (3) a scenario in which coastal routes were easier for migrating peoples to traverse in comparison with inland routes, and (4) a partial agreement on a local scale between genetic similarity and the linguistic classification of populations. These findings offer new insights into the process of population dispersal and differentiation during the peopling of the Americas. NOTE: I inadvertetdly posted a draft of this post. Here is the final post; I will leave the draft online since some people already commented on it, before I noticed it. 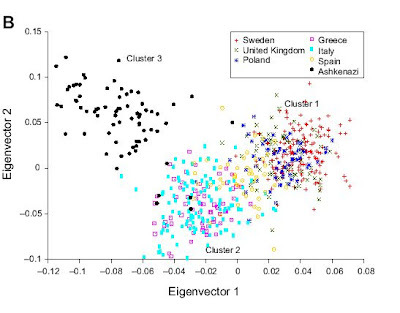 A previous study on Europeans discovered that Caucasoid Europeans, who form a genetic cluster on a global scale can be further distinguished into subclusters that are correlated with ancestry and geography. Now, a new study on European Americans (hat tip gnxp) appearing in the free online journal PLoS Genetics has carried out a similar analysis of the genetic structure of American "Caucasians". The distinctiveness of Jewish Americans is probably due to their having a portion of Middle Eastern ancestry. We can only say that Jewish Americans are clearly genetically distinct from the other ethnic groups presented in the study, although it is unclear whether they are distinct from other groups of Middle Eastern background. As biologically-averse intellectuals continue to question the very existence of race, pragmatic scientists are moving into an era when not only race, but ethnicity may become genetically identifiable. Unlike race which by definition refers to an identifiable biological cluster, ethnicity may (or may not) refer to such a cluster. Ethnic distinctiveness is due to both culture and biology, and the relative proportions of the two factors are specific to a particular ethnic group. When ethnic groups have split recently, co-inhabit a geographical space, frequently intermarry, etc., then it is likely that they will have small biological differences, whereas other ethnic groups may be biologically as well as culturally distinct. Group distinctiveness means: if you are given the photographs of ten Englishmen on one side and ten Russians on the other, you would be able to decide with a very high level of success which group represented the Russians and which one the Englishmen. Individual distinctiveness means: if you are given the photographs of ten Englishmen and ten Russians in random order, you would still be able to sort out the Russians from the Englishmen; whether this is possible, and with what level of success is less obvious than in the previous case. We must wait for more studies with larger samples and more markers to study the biological component of human ethnicity. At present, some groups do seem to have individual distinctiveness in a particular societal context and with a particular set of markers (e.g., Jewish vs. non-Jewish Americans), while others are less distinct (e.g., Greek vs. Italian Americans). Chris S.M. Turney et al. The collapse of the Laurentidenext term Ice Sheet and release of freshwater 8740–8160 years ago abruptly raised global sea levels by up to 1.4 m. The effect on human populations is largely unknown. Here we constrain the time of the main sea level rise and investigate its effect on the onset of the Neolithic across Europe. An analysis of radiocarbon ages and palaeoshoreline reconstruction supports the hypothesis that flooding of coastal areas led to the sudden loss of land favoured by early farmers and initiated an abrupt expansion of activity across Europe, driven by migrating Neolithic peoples. Just a quick note to readers of the Anthropological Research Page (ARP), which used to be hosted at dienekes.angeltowns.net. Due to a problem with the host (supposed hacker attack), the ARP will no longer to be hosted in Angeltowns. All the content of the ARP can be found in the Internet Archive, with the latest version being here. The formatting is a bit off, but otherwise all the content is preserved. I will re-upload the ARP to a suitable server once I find the time. There is a related story in the New Scientist about the following article.